WW1 Reenactments Equipment : Great War Tommy WW1 Food Rations Labels : St George brand condensed Tomato Soup. WW1 Reproductions and WW1 Reenactors Equipment / Kit - St George brand condensed Tomato Soup. "St George" brand condensed Tomato Soup. 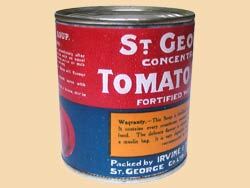 "St George" brand condensed Tomato Soup by Irvine and Stevenson of Dunedin, New Zealand. Fortified with "Ex-Ox", a contemporary beef essence. Fits current Condensed Milk size tins.